So what is emotional dysregulation then? Emotion dysregulation may occur if emotions are experienced as intense and overwhelming, when individuals have not learned how or when to apply effective strategies, when strategies are not applied flexibly, when the strategies fail, or when strategies are overused, emotion regulation patterns may interfere with the ability to successfully achieve goals. Emotion dysregulation still involves attempts at regulation, but the process leads to maladjustment rather than adjustment. For example, emotion dysregulation may result in poor interpersonal relationships, difficulty concentrating, feeling overwhelmed by emotions, or inability to inhibit destructive behaviors. This simply means that emotional dysregulation can make more potent or heighten the effects of alcohol and drugs, increasing the chances they will turn to alcohol. Thus, the combination of emotional dysregulation and high reward sensitivity should be a potent risk factor for the development and/or maintenance of substance abuse and eating disorder. Self regulatory deficits like these may emerge from an interaction of intrinsic biological factors as well as from chaotic or stressful early life experiences, particularly child abuse and problematic attachments with caregivers (). We know from our other research into the neurobiology of the brain that children who have abusive childhoods have altered stress systems and this enhances the effects of alcohol and drugs, with initial drug use more rewarding. So difficulties with emotional and stress control are compounded by liking alcohol and drugs so much. It is a greater release if you like, especially from overwhelming emotions. Personally speaking alcohol appeared to help me regulate my emotions, by this I mean alcohol appeared to take away my fear, gave me positive rather than negative emotions and most importantly in some ways made me more confident and comfortable around people, who had previously frightened me. Thus in a very real sense, alcohol helped to be in charge of my emotions, instead of the other way around. I believe this was embedded in my brain and memory as a survival strategy – alcohol was a place to go to escape. Emotional dysregulation is a distinct construct ( ), related to but not reducible to negative effect (moods, anxiety, negative emotions) and may be seen as the result of the developmental capacity to adaptively regulate emotions being disturbed by early disruptive experiences ( ) such as childhood trauma and abuse. For me, the above means that I have difficulties controlling emotions per se, not just negative, although I do seem to have a negative bias in my thinking as a result of this emotional dysregulation. I have, especially in early recovery real difficulties with feelings of euphoria and elation which sounds strange that these could be problematic but they were because they were always overwhelming and also accompanied by the idea of a drink occurring in my mind because this was an emotional reason for drinking too, “I drank when I felt bad and I drank when I felt good.” It is emotions that activate desire to drink, to escape overwhelming emotions. We are not neurobiological robots, this disease is mediated via our emotions, it acts like “a parasite on our emotions”. Emotional dysregulatlon heightens the potency of the need to drink. From a neurobiology point of view, elation is a stress response also and this too enhances the motivation to drink. So I suggest it is safer to be not too high or too low with certain emotions. Maladaptive cognitive emotion regulation strategies such as rumination ( ) and thought suppression () have been linked to a binge-eating (), and other impulsive behaviors () as well as alcoholism and addiction, all of which may all be a result of emotion dysregulation. Selby (1) addresses the issues of why does emotion dysregulation appear to result in behavioral dysregulation? The connection may lay in the use of certain cognitive emotion regulation strategies (cognitive emotion dysregulation) that actually increase the intensity of negative emotions and cause an individual to engage in maladaptive behavioral emotion regulation strategies (behavioral dysregulation) in order to down-regulate these intense emotions. In essence, the way we regulate our emotions may actually cause us to lose control of them. These are often considered “impulsive” behaviors, without premeditation. While not a behavioral emotion regulation strategy per se, urgency may be part of what causes certain individuals to engage in behavioral dysregulation. Individuals who exhibit high levels of urgency, feeling the need to act when faced with emotional distress, may be more likely to engage in maladaptive behaviors such as substance abuse as a result of emotion dysregulation. As we have seen in an another blog on negative urgency, this emotional distress prompts alcoholics to act rashly without premeditation and that we believe these levels of distress increase and become constant as addiction becomes more severe, to the point they act as an internal stimulus for the automatic responding of drinking or relapse to drinking. This relapse is done with little conscious intention. As we see below, this type of relapse can be accompanied by a “to hell with it!” response after a series of resentments which build up distress levels to the point of “emotionally losing it””and compulsive relapse follows then as a relief from the escalating pressure of this emotional cascade! 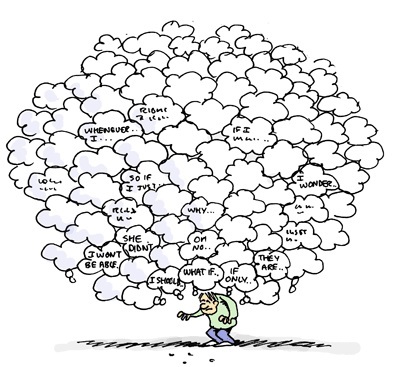 The best characterized cognitive emotion regulation strategy is rumination. Rumination () is the tendency to repetitively think about the causes, situational factors, and consequences of one’s emotional experience. Rumination is an important risk factor for substance abuse (). Thought suppression is another emotion regulation strategy, as is catastrophizing () the tendency to continuously think about how bad a situation is and the negative effects that the current situation has on the future. Using catastrophizing as an emotion regulation strategy has been found to increase emotional distress (). All of the cognitive emotion strategies discussed (rumination, thought suppression, and catastrophizing) appear to have a common theme: they all focus attention on emotionally relevant stimuli, usually negative. Furthermore, evidence has shown that ruminative processes tend to amplify the effect of negative affect. Cognitive emotion dysregulation may then be a result of the intense use of rumination, catastrophizing, and thought suppression when upset. Yet the tendency to ruminate on negative emotional thoughts increases levels of negative affect, and in turn the increase in negative affect increases levels of rumination followed by a flood of racing negative emotional thoughts, which in turn increase levels of negative affect in a vicious, repetitive cycle – an emotional cascade. Bradley, B., DeFife, J. A., Guarnaccia, C., Phifer, J., Fani, N., Ressler, K. J., & Westen, D. (2011). Emotion dysregulation and negative affect: Association with psychiatric symptoms. Journal of Clinical Psychiatry, 72(5), 685-691. Selby, E. A., Anestis, M. D., & Joiner, T. E. (2008). Understanding the relationship between emotional and behavioral dysregulation: Emotional cascades. Behaviour Research and Therapy, 46(5), 593-611. Nolen-Hoeksema, S., & Morrow, J. (1991). A prospective study of depression and posttraumatic stress symptoms after a natural disaster: The 1989 Loma Prieta earthquake. Journal of Personality and Social Psychology, 61, 115–121. and Social Psychology, 53, 5–13. impulsivity. Personality and Individual Differences, 30, 669–689. Anestis, M. D., Selby, E. A., Fink, E., & Joiner, T. E. (2007). The multifaceted role of distress tolerance in dysregulated eating behaviors. International Journal of Eating Disorders, 40, 718–726. How do resentments become the Number one Offender! ?